In 2011 the PLIA learned that NH DES was developing a plan to use Pawtuckaway Lake for storage of water to relieve drought conditions in the Lamprey River Watershed of which it is a part. As PLIA members were alerted to this project, they expressed concerns about its impact on the lake and a desire to be heard on the issue. The PLIA was able to focus this response and develop a meaningful dialogue with DES that included several public hearings with specific attention paid to Pawtuckaway Lake and its needs. As a result of this initiative by PLIA leadership, dedicated members, and Nottingham Town officials, DES included a highly significant and perhaps historic provision in its 8/29/13 Decision affecting winter drawdown of Pawtuckaway Lake. It promised a collaboration between stakeholders like PLIA and the DES in monitoring and managing future lake water use and health, in implementation of both the new drawdown and the overall Lamprey River Management Plan. 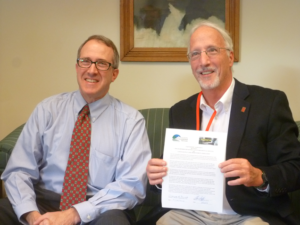 A written agreement of cooperation was drafted and signed by our President and NH DES Commissioner Tom Burack in October of 2013, making us the first lake association in NH to have this kind of working relationship. The objectives that all were able to agree on are Pawtuckaway Lake as a healthy and viable recreational resource as well as water for the health of the Lamprey River Watershed and its aquatic species. Although the Agreement reached its term and has now expired, thanks to this history, the PLIA continues to enjoy a close working relationship with NH DES. 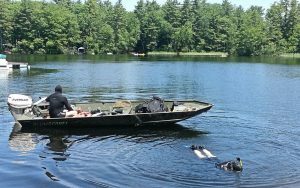 As a benefit of the Partnership Agreement, NH DES has conducted aquatic plant surveys at Pawtuckaway Lake over several years using sonar and collections by hand sampling. The initial results form a baseline that allows DES to compare surveys conducted over a period of years. When Variable Milfoil was detected in late summer of 2015 near a State Park boat ramp, DES was able to inspect the sonar survey from the previous year to determine whether it was new or established growth. The response of DES to this emergency was a swift and thorough removal of the weed by specially certified divers, and a promise of future monitoring of this area. In addition, our Partnership with NH DES has provided increased water testing and management. In 2014, DES measured stream height and phosphorus concentrations at the outlet dams during the fall drawdown. From these measurements, DES calculated the amount of phosphorus exported from each dam. As a comparison with past operations, DES also estimated the phosphorus export if the 2015 release followed historic operations. At the request of PLIA President Tom Duffy, fall drawdown practices were changed to direct most of the flow out of the lake via Drowns Dam instead of Dolloff Dam. This produced a much greater export of phosphorus as a result of discharging water with a higher concentration of phosphorous. DES estimates that the historical drawdown practices would have released 350 pounds of phosphorus. The new drawdown operations released 1066 pounds of phosphorus (716 pounds more than would have been historically released). This exciting and encouraging development holds significant promise for the improved health of Pawtuckaway’s waters. In ­­­­1993, the PLIA obtained a State-funded diagnostic study of the ecological health of our lake water conducted by NH DES. It also funded a program of amelioration at several off-lake sites where significant amounts of phosphorus were leaching and draining into streams that feed the lake. Following a 2006 study commissioned by NHDES, a Storm Water Management Assessment was issued in 2007 with recommendations specifically for Pawtuckaway to reduce the damage caused by drainage of pollutants into the lake. The document is valuable for its descriptions of Best Practices and the creation of protective Rain Gardens. 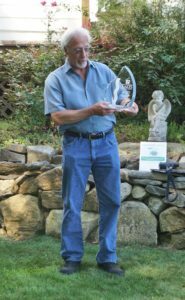 Also in 2006, the PLIA secured a Watershed Assistance Grant from NH DES to identify and quantify specific sources of phosphorus contributing to the lake’s water quality. A thorough report and Watershed Based Plan was generated from this extensive study in 2008.